Once enlighted ideas spread all over Europe, absolute monarchs in Europe were threatened as people demanded radical changes in the political and social systems. Monarchs invested in agricultura and manufacturing. Royal manufacturers and four field rotation were examples of this. Also new crops were introduced. Monarchs supported arts, science and education. Royal Academies were created in the 18th century. Tax systems became a bit fairer by limiting the privileges of churh and nobles. However the third estate paid the highest taxation. Religious tolerance increased and new liberties were included such as separation of powers. Nevertheless, monarchs rejected Enlightened ideas as equality, separation of power, etc. as they ruled as absolute monarchs. 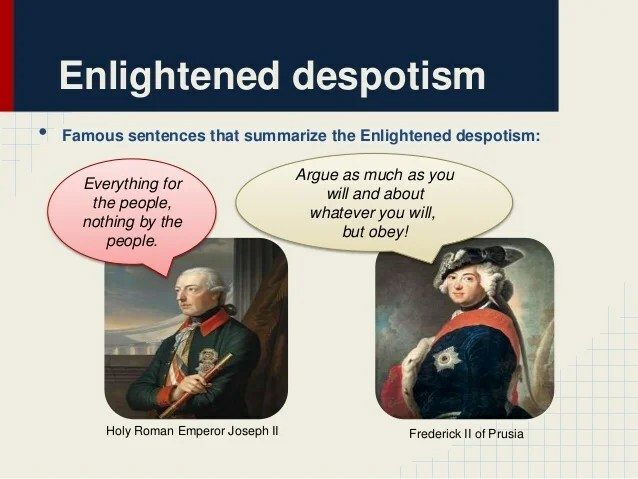 They were known as Enlightened despots. Frederik the Great of Prussia, Catherine II the Great of Russia, Charles III of Spain and Joseph II of Austria.